The 1956 Hungarian revolution, and its suppression by the U.S.S.R., was a key event in the cold war, demonstrating deep dissatisfaction with both the communist system and old-fashioned Soviet imperialism. But now, fifty years later, the simplicity of this David and Goliath story should be revisited, according to Charles Gati's new history of the revolt. Denying neither Hungarian heroism nor Soviet brutality, Failed Illusions nevertheless modifies our picture of what happened. Imre Nagy, a reform communist who headed the revolutionary government and turned into a genuine patriot, could not rise to the occasion by steering a realistic course between his people's demands and Soviet geopolitical and ideological interests. The United States was all talk, no action, while Radio Free Europe simultaneously backed the insurgents' unrealizable demands and opposed Nagy. In the end, the Soviet Union followed its imperial impulse instead of seeking a political solution to the crisis in the spirit of de-Stalinization. 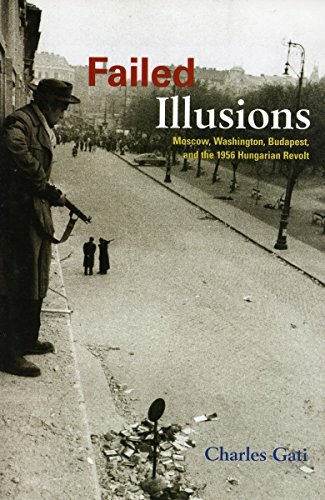 Failed Illusions is based on extensive archival research, including the CIA's operational files, and hundreds of interviews with participants in Budapest, Moscow, and Washington. Personal observations by the author, a young reporter in Budapest in 1956, bring the tragic story vividly to life.